Let's face it, every home is different and unique... and so is every home buyer. 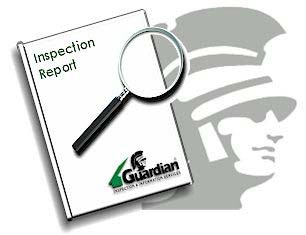 That is why Guardian® offers you a choice of inspection products to best meet your specialized needs. Your Guardian® Inspector can also arrange for special environmental testing and laboratory services, as well as other inspection & information services to satisfy your pre-purchase needs. We also offer our one-of-a-kind Internet Photo Report that allows you to see the inspection through your inspector's eyes -- with digital photographs from your inspection posted at this website, including helpful captions of the defects. (CLICK HERE to learn more and view samples of our Internet Photo Reports)! But don't just take our word for it, learn more about what our clients have to say about our knowledgeable, friendly, and helpful inspectors (Click Here).